But the Permian is one of the outliers — the only other play expected to grow over the next two months is the Utica in the Appalachian region. Combined with the other five plays — the Eagle Ford, Bakken, Haynesville, Marcellus and Niobrara plays — oil output overall is projected to fall to 4.95 million bpd the end of the year. That would be a fall of nearly 560,000 bpd from an April 2015 peak of 5.51 million bpd. 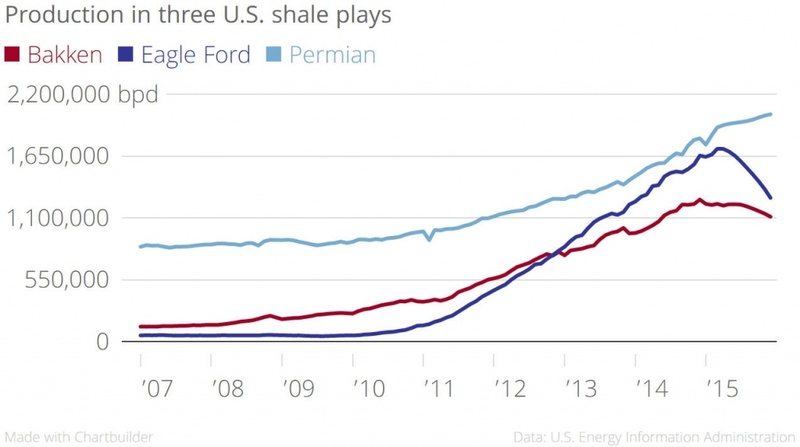 The Eagle Ford in South Texas has had the biggest impact on overall U.S. production growth. The EIA projects output in the Eagle Ford to fall 436,000 bpd by December from a peak of 1.71 million bpd in March.